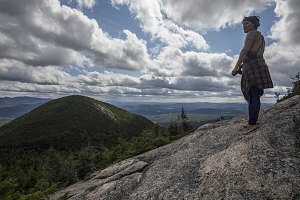 During my years of questing to become a Northeast 111er, I would often drive through the backroads of Northern New Hampshire, skirting the northern edge of the White Mountain National Forest on my way to and from the Presidential Range (and other locations). 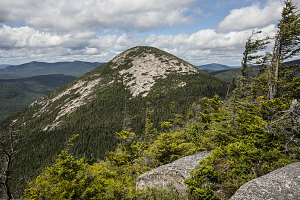 I began to take notice of a particularly prominent summit in this area, just north of the Cabot Range and near the town of Groveton. 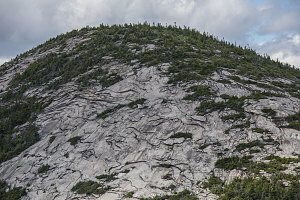 For many years I just knew it as the "pointy peak with the bare rock", for it indeed had those qualities - its upper sides were remarkably bare, at least when viewed from the south. In my [then] 4000-footer snobbery, I mostly ignored it. It was only after finishing my NE 111 that I began to remember the short but prominent little mountain, and thought that it might be worthwhile to visit. After a quick bit of research, I learned that in fact this was a worthwhile peak to visit, and that it (or rather them, since there was a lower adjacent bump) are known as the Percy Peaks -- North Percy and South Percy. 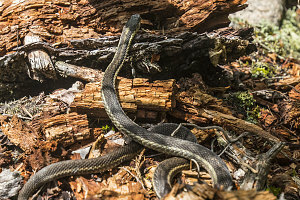 At just under 3500 feet, North Percy was well short of 4000, but it was still fairly well-known - and sported a good trail. 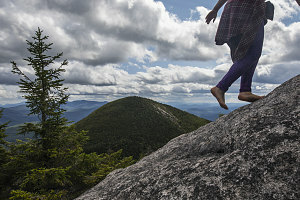 It was even on a list, too - the so-called "fifty-two with a view" - a set of sub 4000-footers in New Hampshire that all shared the quality of having excellent summit views. For a few years now I've been meaning to visit these peaks, but for whatever reason the timing or logistics didn't fit. Finally, however, the day came, on a breezy and cool summer day in August of 2017. And, as you'll soon see, the Percy Peaks are well worth your hiking time! 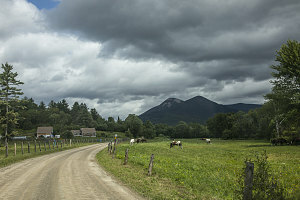 The starting point for the Percy Peaks is from along a dirt road (Nash Stream Road), a few minutes drive northeast of the town of Groveton, along NH110. 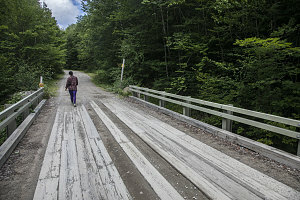 There are several backways that lead from NH110 to Nash Stream Road, the most straightforward of which probably being Emerson Road, just over a mile northeast of Groveton on NH110. Emerson Road led north and merged with Northside Road; following Northside Road east for less than a mile brought us to a junction with Nash Stream Road, and we turned left onto Nash Stream Road. We followed Nash Stream Road north about 2.5 miles until we came to the parking area. Being off the beaten path and not being a 4000-footer meant that this is not a frequented trail. 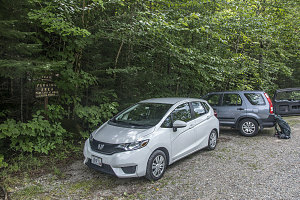 Even though it was a summer Sunday on a nice weather day, there was only one other car parked in the roadside parking area. The parking was removed from the actual trailhead by a hundred yards or so - you have to walk north over a bridge before you reach it. A signed but fairly small little path led into the woods. 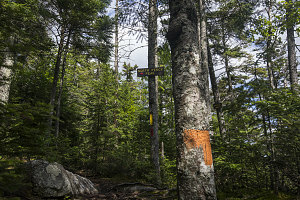 The Percy Peaks trail led upwards right away. Not especially smooth, but not overly rough, either. It led up to the col between North and South Percy Peaks, and as it neared the col, it became quite steep and fairly rough. There's one section where a bit of North Percy's distinctive slab is encountered, today slicked with groundwater runoff. 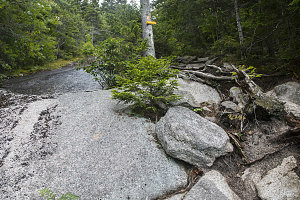 The trail itself stayed just off to the side of this bit of slab, so there was no need for us to test our nerve on the slimy wet rock. Less than an hour of fast uphill hiking brought us to the height of land between North and South Percy Peaks. For some reason in my mind I had envisioned a simple four-way intersection, but that's not how things are laid out. 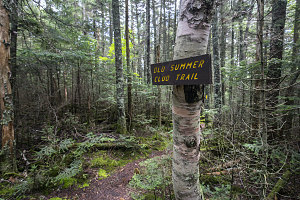 We encountered a junction with the "Old Summer Club Trail", which branched off to the right. 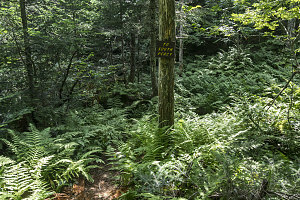 The Percy Peaks Trail continued straight ahead through the col. It seemed from my GPS that turning right was the way to go to reach South Percy (oh, I forgot to mention - our intention was to climb both south and north peaks on our hike). However, there wasn't any signage for South Percy. Utilizing patented best-guess™ technology, I decided hiking down the Old Summer Club Trail was the right choice. 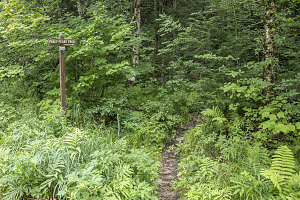 We turned and headed down a delightful cushy track through the forest, and after a slight descent of perhaps two minutes, we arrived at a faint junction with another trail - and a small but clear sign on a tree with "To South Percy" engraved on it. Great - all doubt removed. Being so close in both elevation and distance to South Percy (only 300 feet higher than the col and maybe only 300 yards of distance away), I decided to leave my pack and hike up with less weight. 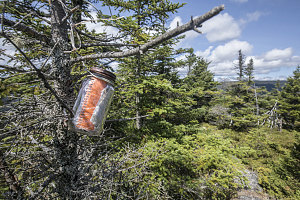 From various trail reports, I had somehow gotten the impression that the trail to South Percy's summit was a tangled bushwhack, and that the summit had marginal views. However, I couldn't have been more wrong! 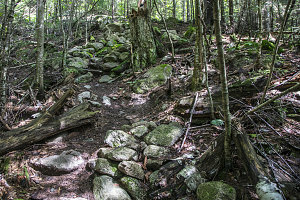 The trail was distinct and easy to follow, free of blowdown, and crossed up through the most magical little bit of shady forest. 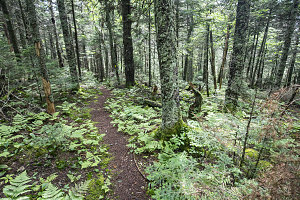 Thick green moss covered virtually all of the open forest floor and the trail was un-eroded enough to maintain a soft, springy character. I was a bit jealous of the bare-footers among us (ie - Rae). 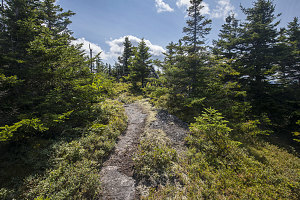 Near the top of South Percy, the trail begins to cross through small open lookouts with superb views north, across the col, to North Percy. Its bare sides looked impressive and imposing from close-up like this. The summit of South Percy was - once again unexpectedly - not a tangled unpleasant mess. Instead, a perfectly pleasant path wound through little snippets of meadow to the highpoint (which had a glass-bottled summit register hanging from a short conifer). Limited open patches gave good views in most any direction you cared to look. This was a damn nice summit in its own right (elevation 3234). Delightfully unexpected. After managing to tear Rae away from picking blueberries (the season for them had started and there were extensive patches here on South Percy's summit), we quickly descended back to my pack in the col. We then retraced our few steps back north along the Old Summer Club Trail to the Percy Peaks trail, turned right, and continued east. 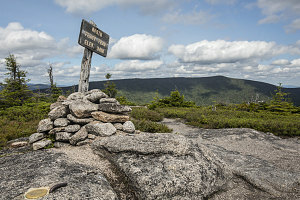 There wasn't any other way to go, and the turnoff to the trail to the North Summit had to be in that direction - which it was, of course, and we reached the junction for it in a few minutes. The trail straight ahead was known as the "Percy Loop Trail", and we intended to follow that later on to complete our day as a loop. But for the moment, North Percy awaited us. The trail to North Percy soon gained elevation, winding up somewhat roughly through scrubby trees. We encountered one of the only two groups we saw for the entire day (the other being a lone hiker on the way back down), testament to the nice seclusion these peaks enjoy. Soon after meeting the other hikers, we emerged onto the slab section of the climb. The trail takes the least steep line up North Percy's south-east flank, but still manages to give a flavour of the steep open rock expanses that characterize this peak. 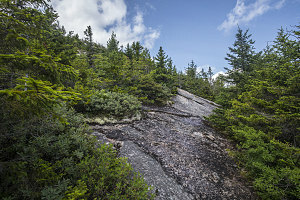 I've seen various trail descriptions state that this section of trail is super-scary, but in reality, if you are at all familiar with slide climbs in the Northeast, you will quickly find that this is not that steep or scary. It is a fairly easy slab climb by those standards. Rae was a bit nervous about the slab initially but soon discovered that she could handle it with aplomb. 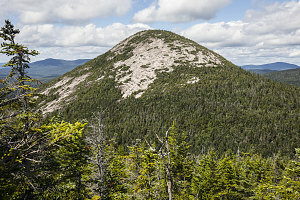 Compared to the bigger peaks of the Presidentials, heights and distances on these diminuitive peaks are such that goals are achieved quickly, and we in no time were approaching the summit of North Percy. 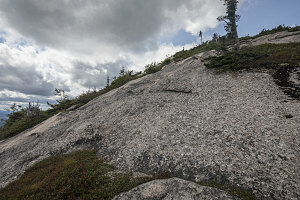 The summit area is not bare slab like the slopes around it, but it is still more open than not. 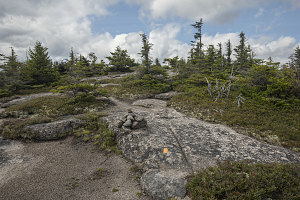 A few short stands of conifers dotted the peak's rounded dome, as well as many extensive mats of blueberries. And yes, those blueberries were starting to come into season, just like on South Percy (perhaps a bit more delayed, owing to the slightly higher elevation). Views from North Percy were excellent, as you might imagine. As long as you stand, the view is mostly unobstructed in all directions. 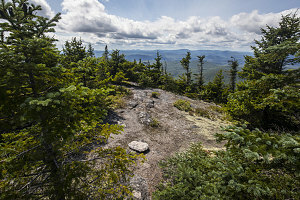 To the south, the fairly distant Presidential Range can be seen, as well as the high mountains in the Franconia Ridge area. 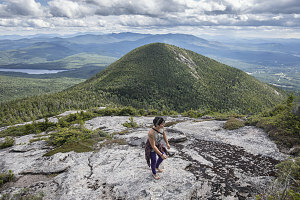 High peaks west into Maine can also be seen.